Tire Installation and Maintenance at Pete’s Tire Barns. Whether it is onsite at your facility or at one our nineteen locations, Pete’s Tire Barns has the specialty tools, trained tire technicians and experience to handle all of your commercial tire needs. We can install new tires, retreaded tires or your tires, repair your current tires and inspect your tires and wheels and more. Our technicians are Tire Industry Association (TIA) certified and have years of commercial tire experience. 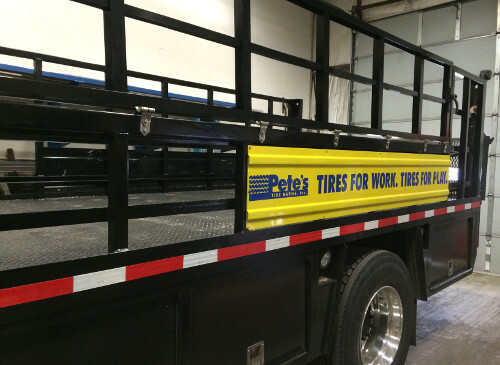 Pete’s Tire Barns tire service trucks are equipped to provide mobile tire service, flat repairs, tire swaps and more. 24×7 emergency truck tire service is available 365 days a year, ensuring your commercial vehicle is never down for long. Our tire service trucks feature on-board air compressors, tire safety cages and lift gates to ensure the safe and efficient changing of tires and wheels in all environments including on job-sites and on the side of roads, highways and other travel ways. Contact your closest Pete’s Tire Barns tire and service location today and request more information on our tire and wheel installation and maintenance services. 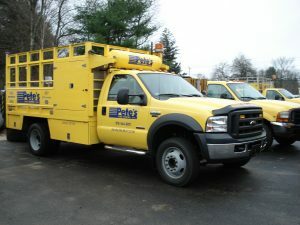 Pete’s Tire Barns operates multiple locations throughout New England, in addition to a large Distribution Center, two Bandag retread facility, employs in excess of 200 people, and operates a fleet of over 100 service and delivery vehicles.